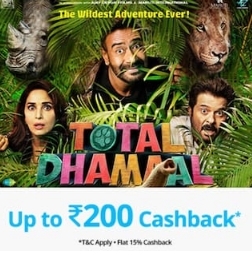 Paytm Offer: Get Upto Rs 200 Cashback on Total Dhamaal Movie Tickets, Paytm has come up with a new offer, Now Paytm is offering flat Rs 200 cashback when you book Total Dhamaal Movie Tickets. This offer is valid till February 23th, 2019. So follow below steps and avail this offer.